Header Image: Iscrizione latina arcaica, VI secolo a.C. EDR 078476. Photo by Giulia Sarullo – Own work, via Wikimedia CC BY-SA 4.0. EAGLE, the Electronic Archive of Greek and Latin Epigraphy, was conceived in 1997 by the Italian Epigrapher Silvio Panciera (1933–2016). Based at Sapienza — Università di Roma, it appeared under the aegis of the Association Internationale d’Épigraphie Grecque et Latine (AIEGL) and an international steering committee. The site launched in 2003, with the goal of providing a gateway for the search of all Greek and Latin inscriptions. The Epigraphische Datenbank Heidelberg (EDH, founded in 1986 by Géza Alföldy). EDH was originally intended to include all Roman inscriptions. From the outset the project included bibliographic and photographic databases. With the launch of EAGLE the focus of the project was restricted to the Roman provinces, excluding Spain and Italy with its islands. The project now maintains records for approximately 75,000 inscriptions, and many entries include photographs. Data entry is largely complete for many provinces. Most of the auxiliary information (metadata) for texts in the database is provided in German or English. The Epigraphic Databank Roma (EDR, founded in 1999 by Silvio Panciera). EDR presents inscriptions from the city of Rome, Italy, Sicily, and Sardinia, excluding Christian texts. The database now consists of 84,573 documents, and many records include photographs. 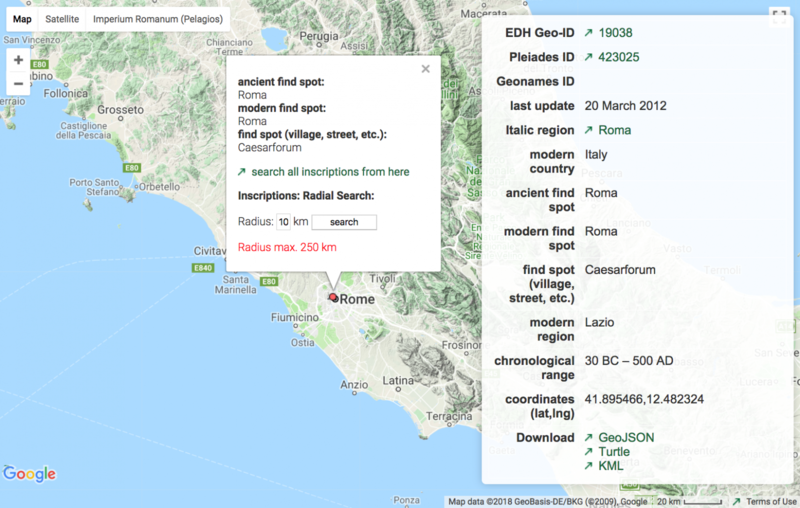 The collections for many regions and ancient cities of Italy are now fully entered, and completion of the database is projected before 2020. 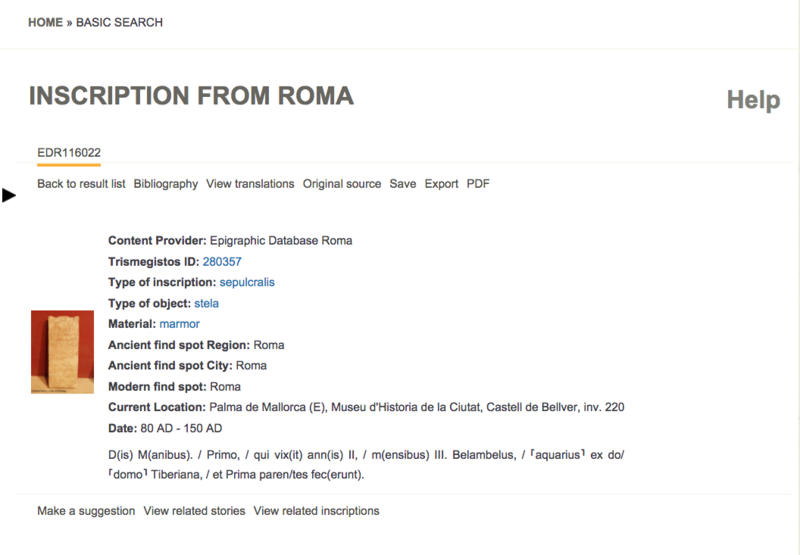 Much of the metadata for EDR inscriptions is in Latin. The Epigraphic Database Bari (EDB, founded in 1988 by Carlo Carletti). 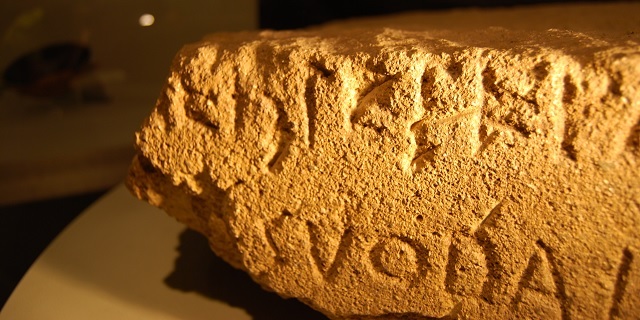 The project assembles the Christian inscriptions from the city of Rome from the 3rd to 8th centuries CE. Most of the material for the database has been provided by the second edition (nova series) of the Inscriptiones Christianae Vrbis Romae (ICVR, 1922–1992), a project also now administered at Bari. Many records are linked to photographs provided by the Pontificia Commissione di Archeologia Sacra (PCAS). At latest report, the database contains 40,815 texts. The metadata for these texts is as a rule provided in Latin. Hispania Epigraphica (variously abbreviated, but most recently HE, founded in 2002 as a joint project of the Archivo Epigráfico de Hispania and Kurt Schaller of the Universität Salzburg). It is difficult to ferret out information about this database. The informational links on the project homepage are empty. Whatever the details of its history and the status of its collection, HE contains 30,798 texts from Spain and Portugal. Most entries are linked to photographs; the database includes a bibliography. As a rule, the metadata are in Spanish. These collections remain pillars of the EAGLE “federation” of databases. Even from this brief account, their individual interest and complexity should be apparent—and also the complexity of aggregating them for a reliable unified search. Furthermore, several unique features are best accessed from within the individual databases—I direct attention only to the example of the geographic database provided since 2012 by the EDH. The first EAGLE gateway went live in 2003. The site, like EDR, was hosted by la Sapienza, and its day-to-day administration fell largely to Italian scholars. The original website is still accessible, and it is worth a glance in order to appreciate the improvements in the new version. Of course in 2003 the editors could not have the prescience to adopt what have now become the standard markup conventions for presentation of papyri and inscriptions online, EpiDoc; the conventions had only begun to be developed from 2000. In the first manifestation of the site, too, the constituent databases are not well integrated by the search engine. A search in EAGLE redirects to the sites of the individual databases and opens results in four separate windows. Ten years after the launch of the original EAGLE, the European Union, as part of its Europeana program, awarded a grant from 2013–2016 to develop a new EAGLE. The Europeana program was launched in 2008, with the purpose of establishing a digital platform for disseminating to the public the European cultural heritage. After receipt of this grant the original acronym for the project was retained, but the name changed: EAGLE became the European Network of Ancient Greek and Latin Epigraphy. The shared title suggests it is fundamentally a continuation and elaboration of the earlier project. The new portal continues to be administered by many of the same scholars who managed the first EAGLE, most notably Silvia Orlandi, and the project continues to be housed at la Sapienza. A “virtual exhibition” of photographs of famous inscriptions (and not only Latin ones). These can be displayed in both a standard web version and a “3D” version (for me, the 3D loaded very slowly). The narrative and organization of the exhibition is uneven and there are many defunct links, but the material is well worth exploring for the images, which are beautiful and informative. A “storytelling platform.” This element of the project includes on the order of 40 posts, the most recent dating to the summer of 2017. These aim to provide engaging popular accounts of rebarbative epigraphic topics. They deserve examination not only for their intrinsic interest, but also for the “EAGLE storytelling app,” developed by the Deutsches Archäologisches Institut (DAI) for EAGLE. The app provides an elegant way to integrate material from the EAGLE databases and from other sources, such as Wikimedia Commons, into WordPress posts. On a Wikimedia page, EAGLE hosts translations of Greek and Latin inscriptions into a variety of European languages. The project invites registered users to contribute corrections and new translations. Here may be found the translations of many inscriptions not included in the Latin and Greek materials of EAGLE: for example, Roman Inscriptions of Britain and the translation project Attic Inscriptions Online. There are also translations of many of the Latin and Greek texts to be found in the EAGLE databases; these are not, however, linked to the database of original texts. EAGLE hosts a Zotero bibliography, founded in part on large databases long compiled by members of the project. The material is available for download, and EAGLE invites registered users to make corrections and contributions to the bibliography. EAGLE plans to develop a mobile application which will use optical recognition to provide sight-seers with on-the-fly information about inscriptions (see p. 11 of this .pdf). For scholars, the centerpiece of EAGLE is its search engine, and to use it intelligently users will have to investigate at the outset the constituent databases and their contents. EAGLE continues to aspire to general coverage of Greco-Roman epigraphy; the contents of the participating databases, however, are primarily Roman. The four original partners (EDH, EDR, EDB and EH) continue account for approximately 230,000 texts—half of the 455,415 inscriptions that can be searched through EAGLE. The new EAGLE has supplemented these with other, mostly smaller collections, listed and explained on the entry page for the search engine. Among these a large and notable database is the Epigraphik-Datenbank Clauss/Slaby. To drill down further into what is contained in each of these individual databases, one must investigate them one by one: EDH and EDR provide exemplary, clear, and detailed accounts of the state of their contents. The EAGLE search engine allows for simple word or “and/or” proximity searches. What I would have called “wildcard” searches can be conducted by enabling “substrings.” Searches can be limited using various fields of the metadata (e.g. findspot, object type, material, etc.). However, given the different languages and conventions used for metadata by the contributing databases, the field limitations are almost more frustrating than they are useful. EAGLE’s organizers recognize the problem, and are working toward a common vocabulary of classification. 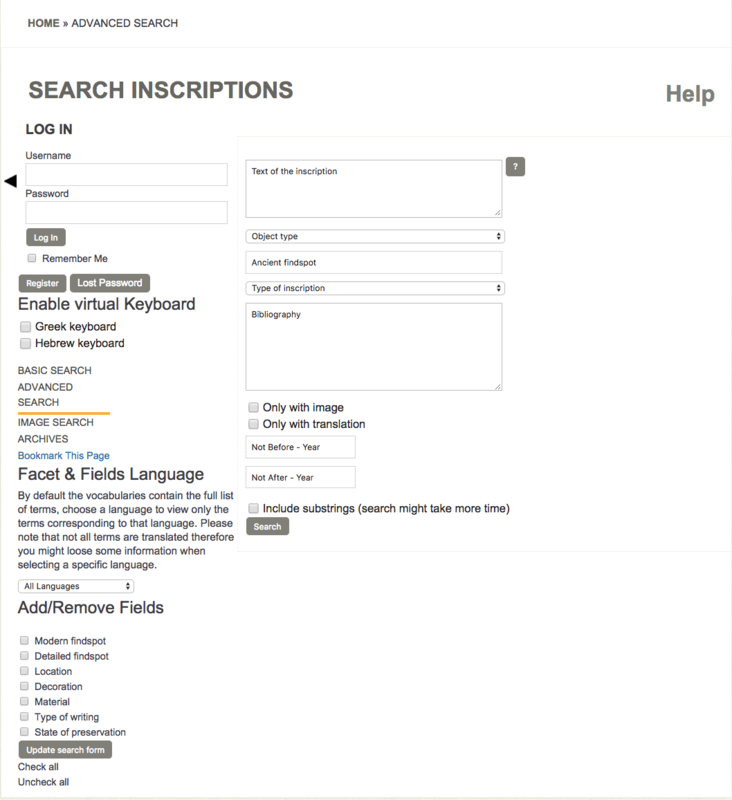 Topical fields in specific entries link to lists of synonyms; but limitation of searches by such fields is unreliable. Search results appear in a uniform and elegant format. Texts can be downloaded from the database, but only by registered users (I applied for registration in mid-February and as of September 20 had not received a response). The EAGLE portal, then, is an ambitious project, and a major resource especially for those working with Roman inscriptions. With the expiration of the Europeana grant in 2016, a new group has formed to administer the site: the International Digital Epigraphy Association, or IDEA. What is the Future of Digital Epigraphy?